Well, here we are! It's December 31, 2018. The end of another trip around the Sun. This has been a year of extraordinary growth for me. I experienced professional success, personal achievement, devastating heartbreak, unexpected challenges, and massive amounts of travel - both for fun and for less-than-great reasons. 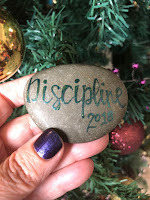 At the end of 2017, I chose the word Discipline as a guide for this year (this is the post I wrote about it). 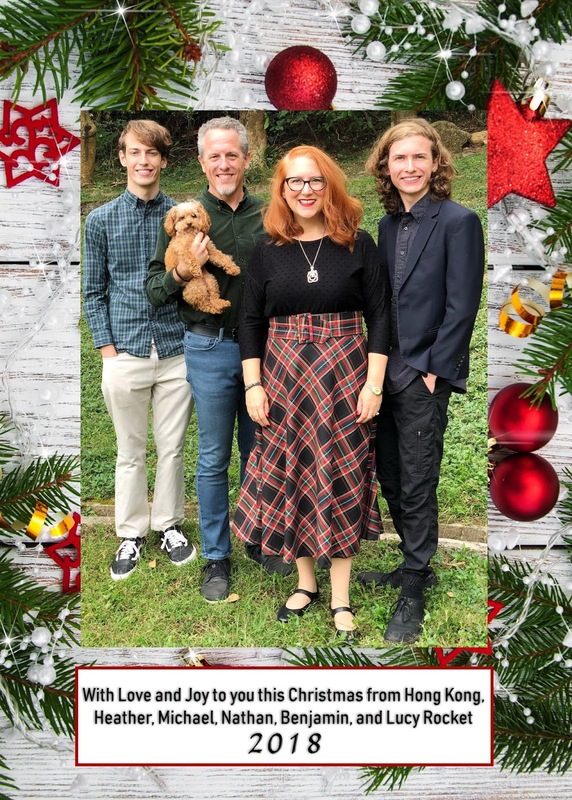 In 2016 I'd been commissioned to write a big project, and fitting it in to my life as a mom and wife and otherwise busy human was a huge challenge. I realized I needed to proactively create space in my life to be ready to accept more big projects, or to just finish the ones I'd left languishing in my hard drive for way too long. It was a good, much needed word for the year. My aim was to write more, and I did. 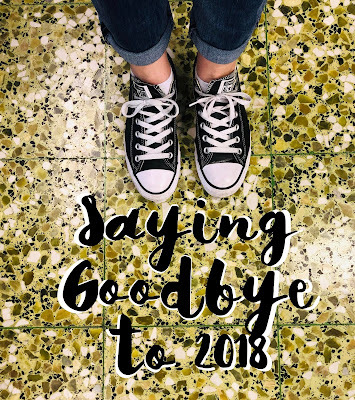 I wrote at least 1500 words, four days a week, no matter what else was going on (through migraines, bronchitis, 17 hour flights, general "not feeling like writing" feelings, on boats and buses and planes). I finished writing a play, which was produced in America this last Spring. I wrote two books, neither one "finished" but both are pretty far along and I feel great about the significant progress. I wrote heaps of travel content for a company in the U.K. I hand-wrote postcards and letters and cards, well over 200 in the last 365 days. 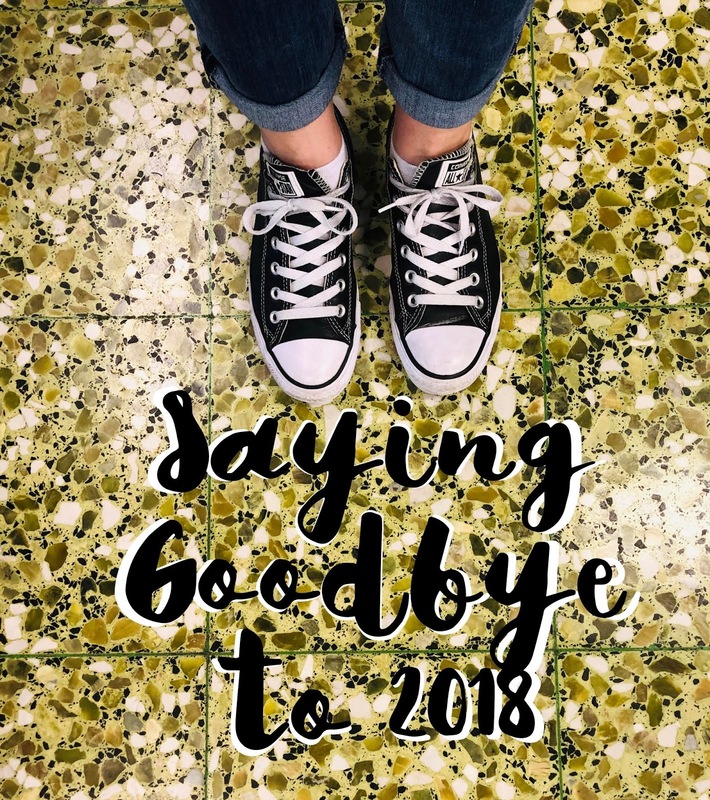 I got distracted - but not derailed - quite a bit, especially when exciting new possibilities popped up which didn't really fit my specific goals for this year. 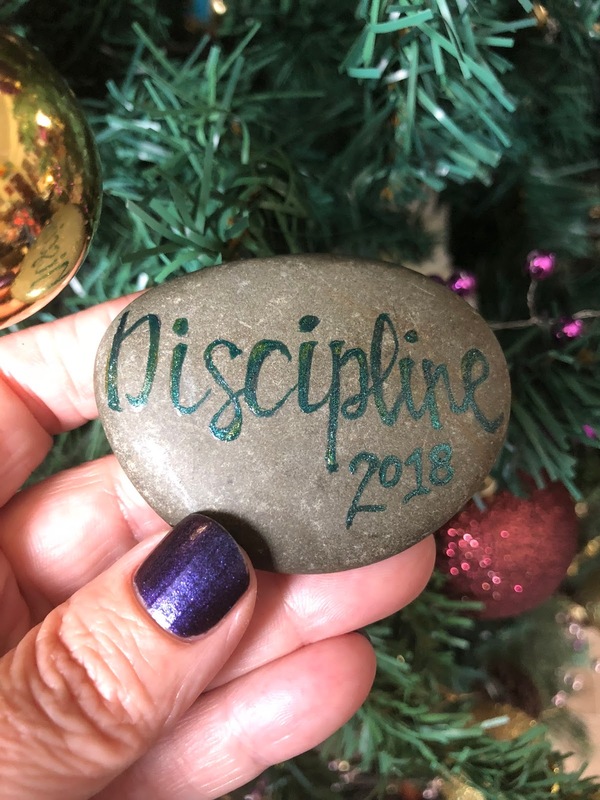 But because I had the word discipline to guide me, I was able to course-correct and stay on target for what I wanted to accomplish. As always, there were some unexpected benefits to my chosen word. Because part of discipline is self control instead of just giving in to every impulse, I cut down on frivolous spending and focused on economizing in many areas. For the first time in well over a decade of moving around the globe, my husband and I got 100% out of debt. Being out of debt meant we had more funds at our disposal for travel. And WOW did I travel! 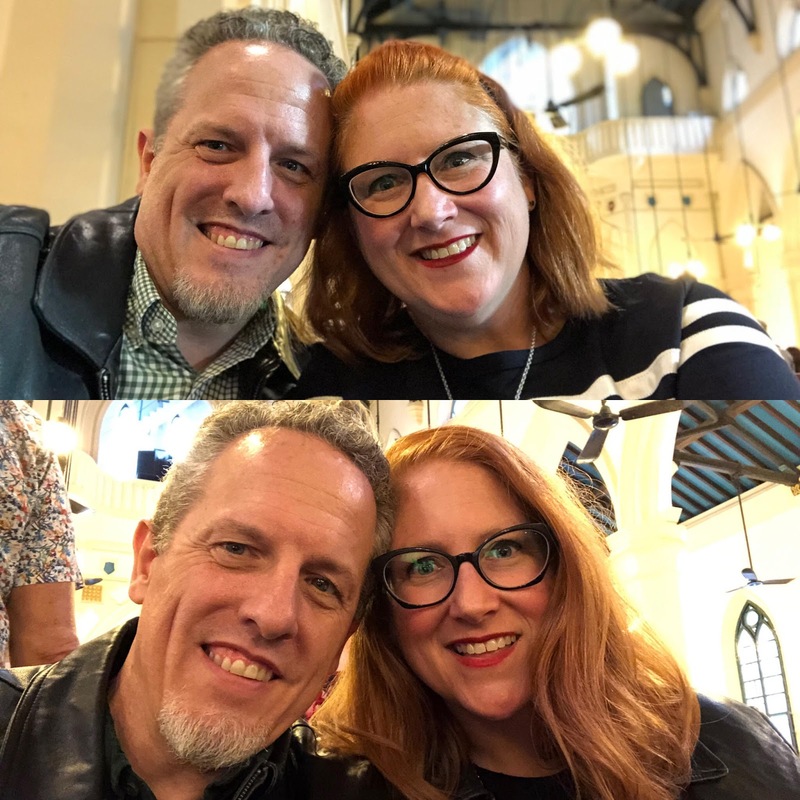 In 2018 I flew to America and back a whopping FOUR times, went to Shanghai twice, vacationed in Vietnam with the whole family, went for a romantic long weekend in Paris with my hubby (sans offspring! ), and hopped over to Tokyo two times. I managed, without planning, to go to all twelve Disney theme parks in the world, something we accomplished on purpose with so much careful planning back in 2013 for our Year of the Mouse. My commitment to discipline brought health benefits. This summer was the five year anniversary of my hysterectomy. I hopped on the scale at a check up and realized I'd gained ten pounds since the day I'd had my uterus and a fist-sized non-cancerous growth removed. Part of that is to be expected (thank you, stupid early menopause! ), and to be honest, ten pounds in five years isn't such a huge amount. But I thought for a minute about what gaining two pounds every year for the rest of my life would look like, and realized that isn't what I wanted my story to look like. Because I have two herniated discs in my lower spine and some complications from an abdominal surgery 15 years ago, I have no way to safely do any type of intense or weight-bearing exercise without causing pain or further damage. I'm limited to walking and swimming. Instead of continuing to let that be an excuse, I got a new Fitbit and committed to walking instead of taking the bus or a taxi around town. I made sure I hit my goal of five miles on foot every day, even if it meant marching in place in the hour before bedtime (not ideal, but that's what discipline looks like). My doctor, however, repeatedly told me that there is no way to "out exercise" a bad diet. I confess, that other than when I had an ulcer and was told to cut out Coke and spicy food for a period, I've never been on a diet in my life. That's not bragging: I had the body that clearly comes with eating whatever you want and exercising less than you should. It was time to make some changes. 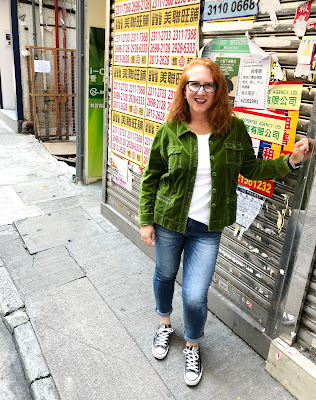 I have (no lie) a dozen friends who are selling weight-loss products and systems, but I live in Hong Kong, where a lot of the products are prohibitively expensive to ship here or altogether unavailable, and let's be honest... I'm a wife and a mother who lives in the real world and travels a considerable amount and can't cook one thing for myself and something else for the rest of the family. 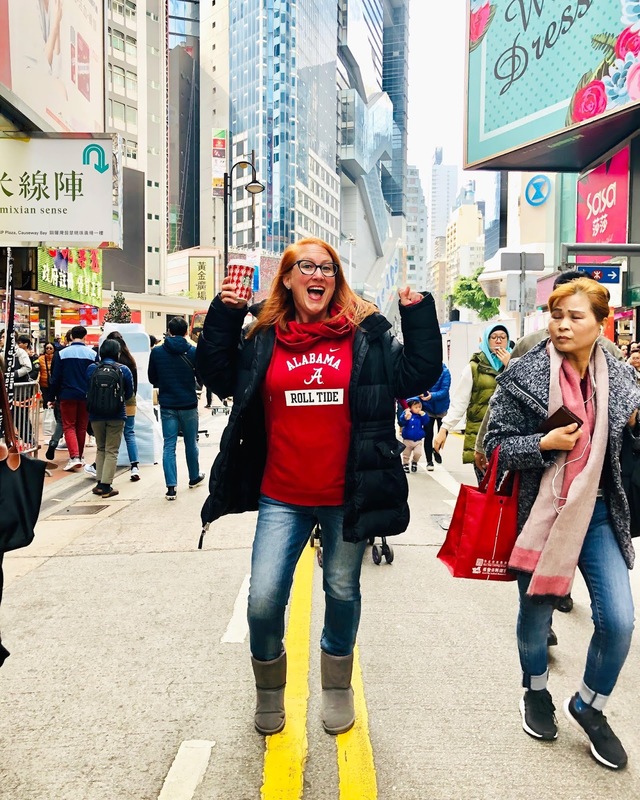 I needed the skills and knowledge for how to eat better wherever in the world I am, with whatever options are in front of me, and the strength and accountability to make the better choices. So I turned to an app, Noom (nope, I'm not selling it, nothing to sell, just answering what I know will be your next question of how I did this). It's not free, but it was FILLED with educational pieces and heaps of support and accountability and helped me to make small changes every day, replacing less-than-great habits with better ones, and cutting a whole bunch of other things out of my life completely. After two weeks, I'd lost the ten pounds and gained a partner for the journey in my husband, who joined me in making better choices. On this last day of 2018, there are forty less pounds of me than there were on the first day, and thirty less pounds of my husband! Yeah, yeah, sure we look better. I wasn't doing it for aesthetics though. I've always liked my body and my face and my curves, they are what brought me this far in life and I will only bless, never curse them! But I was tired of the limitations of my body in its former state. I was tired of the back pain and fatigue that comes with eating a lot of sugar to keep going. Now I feel better... my chronic back pain has lessened considerably since I'm not carrying around those extra forty pounds. I'm more educated on what is good nutrition. And I've been able to learn how certain foods affect me negatively, and have been able to say goodbye to them without any tears, since the end result is never having to feel awful again after consuming them. If you're curious, the "diet" is really just reducing calories, tracking everything you eat and weighing yourself each day (amazing way to see cause and effect on the daily), making better choices (a bowl of grapes and a handful of raisins have the same calories, but one will make you feel full much, much longer), eating mindfully (goodbye late night snacking in front of the telly) and remembering to move every day. Nothing crazy, nothing special to buy. It's all common sense but it was hard for me personally to put it into practice without the accountability of the Noom app. If you're interested in checking it out, you can have a two week free trial plus a 20% discount if you choose to continue with my link here. Again, I'm not selling anything... just telling you how I did it and why it worked for me. Depending on where you are in the world or journey, something else might work better for you. Go be awesome, whatever that looks like for you! Honestly, I don't think I could have done any of this in 2017. I was holding on for dear life with an international move from Shanghai to Hong Kong and adjusting to having the boys home full time after so many years in boarding school. But the benefits of living out my word for 2018 are innumerable. There are a lot of other things which happened this year as well. Many things aren't my story to tell, yet there's no way to untangle just my own parts to share from the various situations. For now I'll just say that I'm grateful for the strength and growth I experienced this year by living a very disciplined life. The training really got me through. I was asked for three words to describe this year, and came up with Difficult, Unexpected, and Rewarding. Despite the challenges, there was so much beauty as well. Sometimes the hardships were laced with exquisite goodness, which means I can look at everything with gratitude instead of wishing it away. That is truly the biggest gift of this year. This photo from yesterday pretty much sums up my feelings about the future. I feel warm and cozy, protected against the cold, I've got coffee in my hand (skinny caramel latte - no added sugar), a ridiculous and enormous smile on my face, joyful passion oozing out of every pore, and I don't even care one bit about the lady walking past who is having none of my enthusiasm. This is me 100% living my best life, ready for 2019 and beyond! I hope you're feeling the same. And if not, you can share some of my enthusiasm... I've got plenty to spare! A little over a year ago this idea that we'd be moving back to Hong Kong began to percolate. And then it actually took shape. And then we did, and here we are. The thing that made me dizzy with glee was the unexpected symmetry. The closing of a loop. Here's the thing... my oldest son began Kindergarten here in Hong Kong, the first time we lived here. In the most perfect bookend ever, my oldest son just started his last year of compulsory education, also here in Hong Kong. Maybe that doesn't seem like a big deal, but in between the first time and this time there were three elementary schools in America, an online academy in Macau, a local Chinese boarding school in Shanghai, and the first year of A Levels last year in Hong Kong. A mind-boggling eight houses in four countries. It's strange and satisfying and beautiful, the very winding road that led us away from here and then back again, and mostly I'm just in awe of how it all worked out. Photo on the left is my firstborn pressing the button to the lift to the lobby to the school bus that drove him away from me for the very first time. 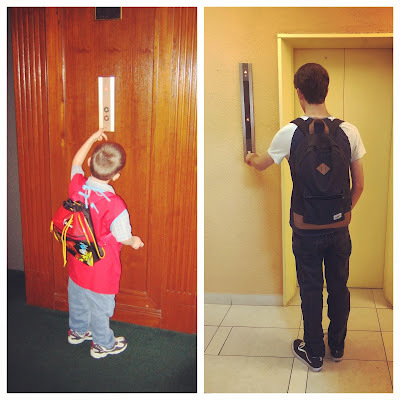 Photo on the right is the same now-grown up man pressing the button to the lift to the lobby to the ten minute walk down the hill to his school. I accompanied him on the walk, even though he didn't want me to. It's not often you realize you are experiencing the last of something, and I wanted to be there as witness. I want to tell this story to him when he has his own baby starting Kindergarten or finishing high school, that I was there, I remember. We left Hong Kong the first time in the middle of the school year, an awkward time for families to move. We had to make a nearly impossible decision of what grade to put this child of ours in for his first year of school in America, with their different set of dates as Kindergarten criteria. That decision kept me up nights because all I could think about was this exact moment of time I'm living in now... did we want him to be 17 or 18 years old when he graduated from high school? I remember so clearly the frustration on my husband's face when I'd bring up yet another reason we should either hold him back in Kinder in America or let him go into 1st grade. Because of his November birthday, days from California's cut off date between grades, we had to decide if he'd be the oldest kid in his class or the youngest. We went with the former. And in the early years it was very exasperating for his teachers, trying to keep the attention of the kid who was already reading chapter books while the rest of the class was still learning the alphabet. But he turns 18 in a couple of months and that extra year was the best thing we could have given him. It's only in looking back that I can see we clearly made the right decision. Thumbs up to the sleep-deprived me of thirteen years ago! And thumbs up to all the mamas sending their babies to Kindergarten for the first time this week. Enjoy the wild and beautiful ride you've just buckled into. The rest of us will be waiting here at the exit, lost in memories and trying to figure out exactly how they mysteriously grew up right in front of us, even though we never took our eyes off them for a second.